Occasion dresses are never enough! Although we love those every-day style dresses, we can not deny that the occasion dresses are also important and sometimes they look much more generous and stunning than the casual ones. Most of us are just ordinary office workers or students, we are not able to wear the fancy party dress as our most often outfit, however we also have some special occasions in our lives. As I often say, don't let yourself be confused by unprepared. Occasion dress also need be updated because you never know if there will be a very important occasion to attend! Hence let’s start and get some ideas about the occasion dresses. 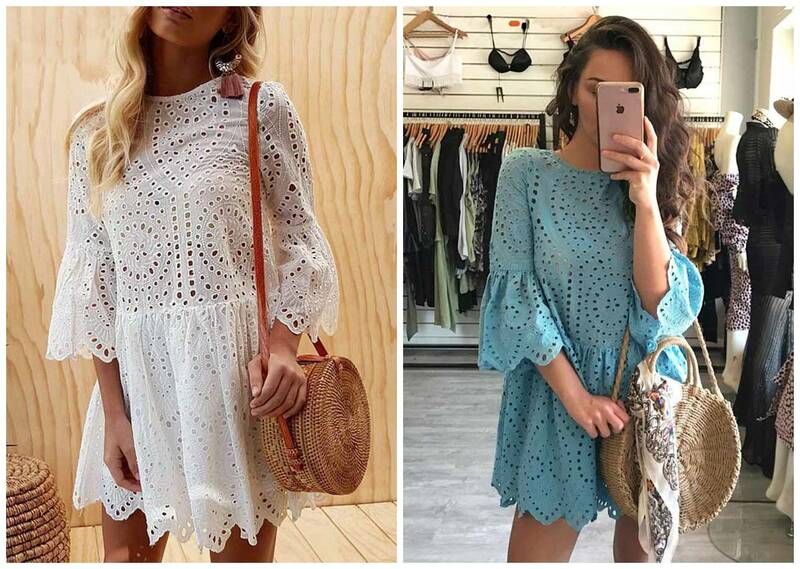 Eyelet dress is absolutely on the trend in hot months, it’s chic yet breathable enough so that you don’t need to worry about getting super sweaty while you want to protect your skin from sunburn. This dress comes in white, pink and blue, if you want to look fresh, white is for you, or can opt for pink to create a sweet vibe and blue may suitable for someone want to look different! Another super hot element this year is metallic texture! If you browse Instagram, you can find that almost every fashion blogger has at least one metallic item. This is a very good idea for party dresses, who doesn’t want to look stunning at parties?! Tired of the plain life? Occasionally dressing fancy is a good choice. If you want to look more feminine, slip dress is definitely in the top three of my recommendation list. The smooth fabric make it has a elegant and expensive feeling. But please pay attention that it is easy to look like the nightgown, so you can pair with belt or layer a statement top on it, DIY your own collocation. 上一篇： How to stay chic in summer rainy days? 下一篇： Are u excited about the coming autumn?